Built 1872-1874 by Emil von Förster. 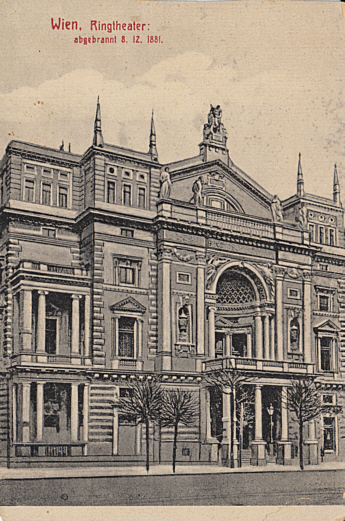 Opened 17 Jan 1874 as "Komische Oper" with Rossini's opera "Il barbiere di Siviglia". Later renamed "Ringtheater". Destroyed by a fire on 8 Dec 1881 during a performance of Offenbach's opera "Contes d'Hoffmann", resulting in 384 deaths (and ultimately, new legislation on theatre safety). Replaced by the "Sühnehaus" (Atonement House), a housing estate funded from private means of Emperor Franz Joseph in memory of the fire victims. Its revenue was designated to charity. Severely damaged by bombs in 1945, remains demolished in 1951. The site is now occupied by a police office block. Front Text: "Wien, Ringtheater: abgebrannt 8.12.1881"